Chanteur Country US aveugle, né Peter Webster Cassell, le 27 Août 1917 à Cobb Country (Georgie). Pete Cassell est décédé le 29 Juillet 1954. 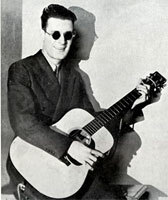 A blind country minstrel content to perform on radio broadcasts rather than record his material, Pete Cassell impressed many listeners with his near-perfect pitch and self-taught musicianship. Born in Georgia on August 27, 1917, Cassell was blinded in his infancy, and received his education at special schools in Georgia. He specialized in law, but turned to performing after teaching himself to play guitar and sing. He first appeared on radio in the late '30s for WSB-Atlanta, and spent the rest of his life in roughly yearlong stints for stations in Georgia, West Virginia, Virginia, Pennsylvania, Missouri, and Wisconsin. 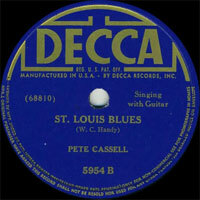 Between the migrations, Cassell recorded sporadically for Decca, Mercury, and Majestic, from March 1941 to 1949. None of his sides became popular, though Cassell was a hit for nearly every station he performed with, including Wheeling, WV's talent-packed WWVA. He died of coronary thrombosis in 1954. 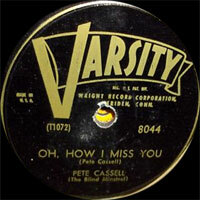 In 1993, Old Homestead released a collection entitled Pete Cassell, Blind Minstrel.